---AER Test Subject B-204 scanned the meager Gue outpost. The mercenary orks were gearing themselves up for a fight, while their grot slaves and Gue employers tended to the heavy artillery and tanks. The small building behind the defense perimiter was the only logical location for a captive of war. He would have to clear the entire compound before he could He picked up on the sounds of the approaching cadre. He could faintly hear the engines of their Necron collaborators too. Promising them Fio technology in return for their services seemed like a weak lie to B-204, but the simple machines had agreed anyways. They might become an issue, but not if the Shas'El's plan worked. 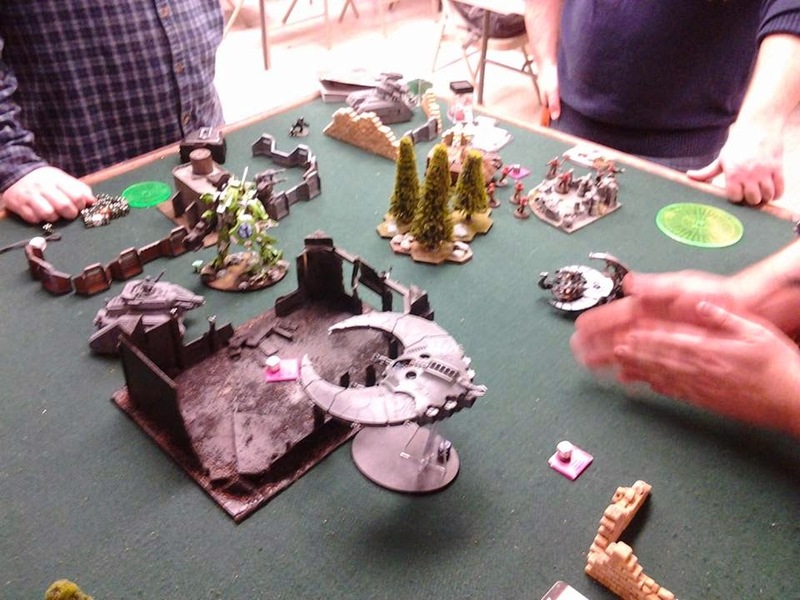 This was actually a practice match for an upcoming doubles tournament I am helping throw at our FLGS. 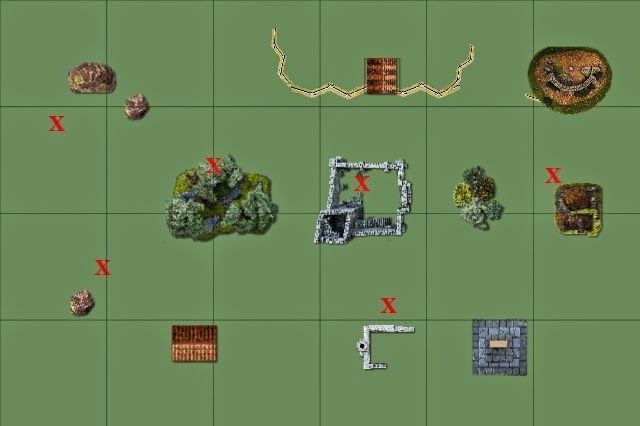 The restrictions are pretty simple: 1000 points per army, Battleforged. This was a very fun match that came right down to the wire. He is relatively new to the game, so he was still finding out what units he liked and what units were good. Not a terrible list for 1000 points, and it turned out to have all the pieces we needed to win. My own list was pretty straightforward. MSU for nabbing Maelstrom objectives, with some fun characters thrown in. The Culexus was included for dealing with Invisibility during the tournament. A scaled down list of his usual: Mechanized infantry, supported by his Warlord tank combo and stationary elements. I have to confess that I don't actually remember much about the list. He was using a special formation that gave him lots of characters to put into his Boyz mobs (3 in one and 4 in the other). So I've left the characters out of the batrep diagrams completely. Warlord Traits: Necron Overlord could re-roll the D3 result for take-and-hold cards. Pask had his special trait. Disclaimer: The diagrams may not always match up exactly with the pictures. Things get forgotten or moved around in the mind. Just take it in stride and keep reading. They set up in a big line. They had lots of models so they didn't have much choice. 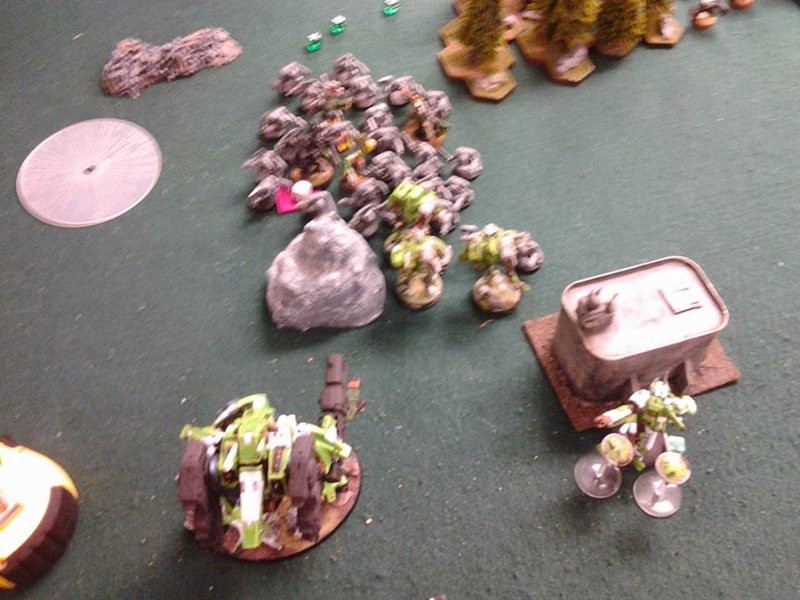 The orks took the left side and the AM took the right, sharing their Aegis with the mek guns. I took the lead and laid out our plan to my partner. 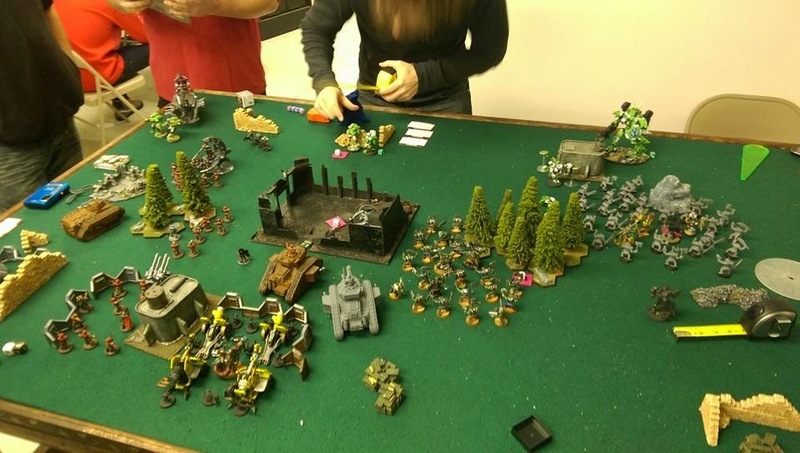 We had superior mobility, so I would deploy my sweet units to draw his orks straight across, while the rest of our forces would focus on the AM and mek guns on the other side of the board. I infiltrated the Assassin into a large black building, as close as I could get him, hoping he would go unnoticed. I chose to Deep Strike my two monat Heatwave-D's. 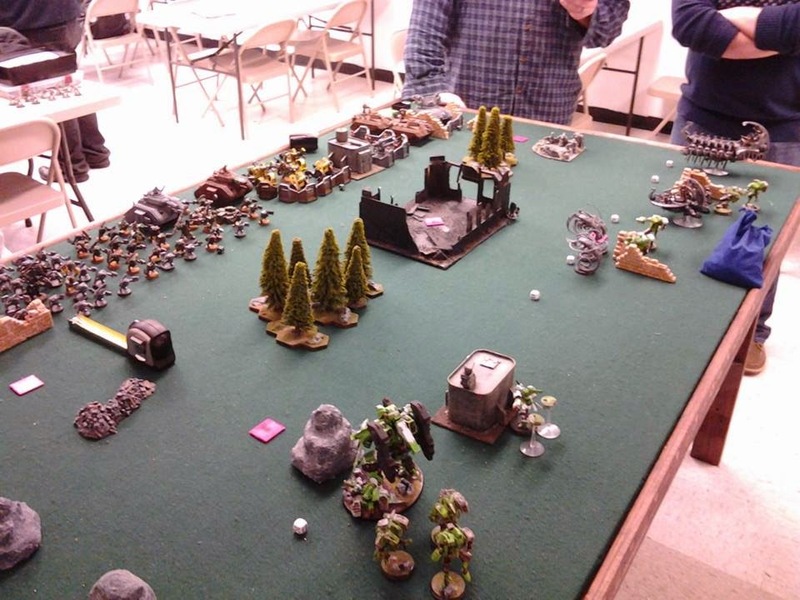 The orks ran straight for my units, while the tanks negotiated their way around the terrain. The vets stayed in their metal boxes, waiting for their chance to try their own brand of Fish of Fury. 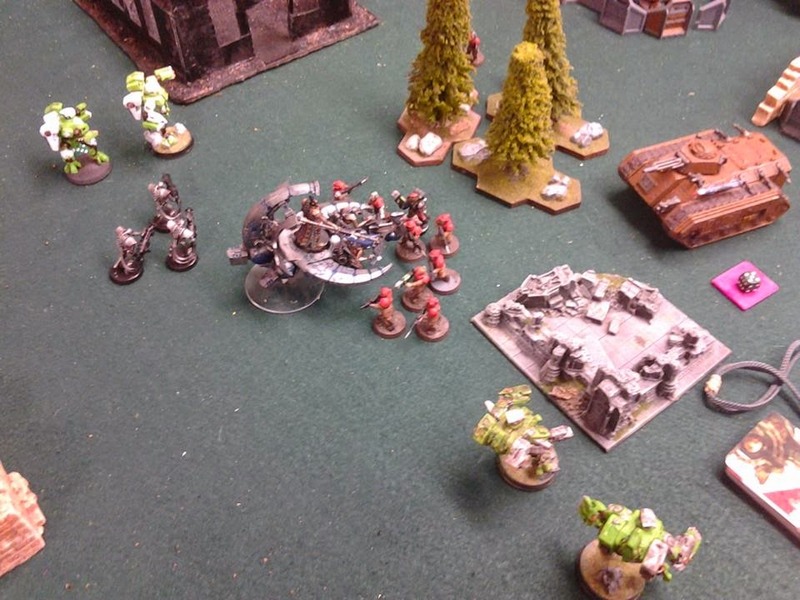 Despite lots of long range shooting from the Wyvern, mek guns, and the Leman Russes, they were only able to kill an Immortal and a Wraith, wound a Crisis suit and wound another Wraith. Wraiths had a nasty reputation in our area, even though these ones weren't even upgraded, so they were focusing pretty hard on them. Based on our starting Maelstrom card, we needed to hold 3 objectives, so I moved up to claim my closest. The rest of the army advanced, with the Wraiths catching up to my assassin in the central ruins. The Doomsday Ark annihilated a Chimera, winning us First Blood. His other Necrons targeted the now-disembarked Meltavets, killing a couple of them. My own shooting was fairly ineffective, killing just a few of the boyz. 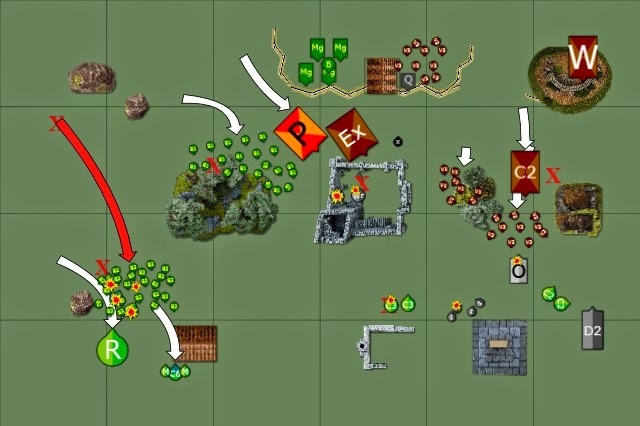 The Assassin ran right out into the middle of the board, daring the entire army to shoot at him. 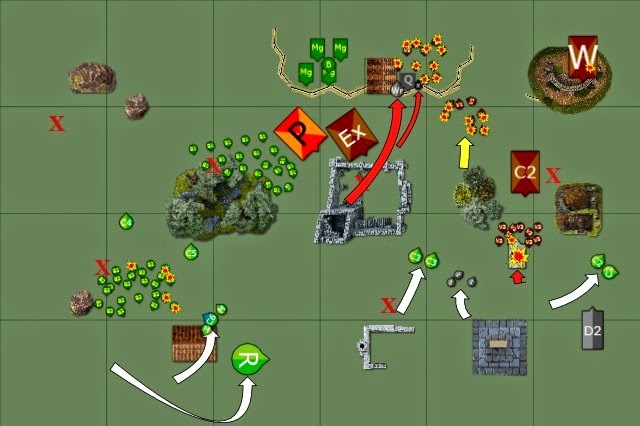 In the assault phase, I jumped some of my units back, but had to leave my Deathrain-D's in charge range to claim the objective. It was a shame, but this game is all about objectives, and this would get us D3 re-rollable points and generate another Maelstrom card. We scored our objective, but even with a re-roll we only got one VP for it. Boo! What a waste of my unit and our warlord trait! At least we had First Blood, and our opponents hadn't scored their objective yet. The plasmavets disembarked and they all made their way for the Overlord. 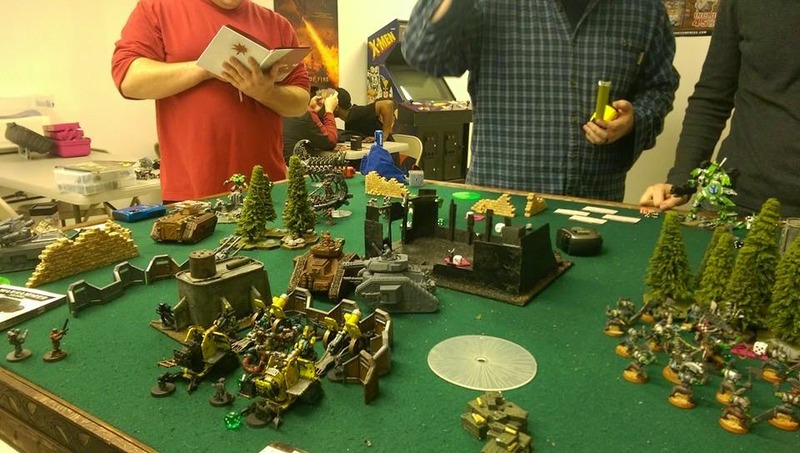 The Tanks shuffled some more, trying to get line of sight on the Wraiths hidden in the ruins.The orks moved up as well, announcing their Waaagh! and easily getting into combat with my poor Deathrain-D's. PunisherPask+Executioner failed to kill the wraiths completely. One escaped with a single wound! Afterwards, he popped smoke, so it would be hard to shoot his tanks. Everything else targeted various things, but didn't accomplish much. 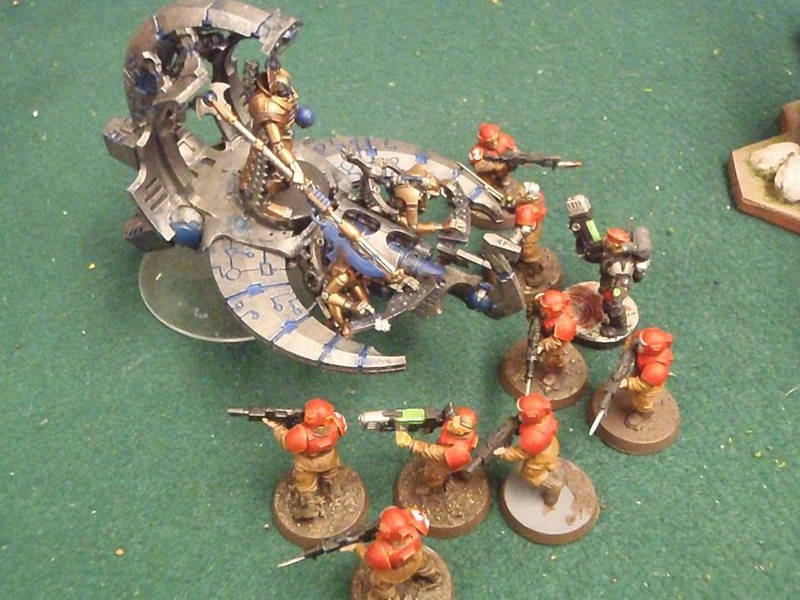 The mek guns seemed to vary in their capability, destroying things one turn and completely whiffing the next. The special-weapon-vets all shot at the Necron Overlord, getting a couple wounds/HP. The vets manning the quad gun fired at my approaching assassin, but he dodged the las rounds with his lightning reflexes! In combat, the crisis suits were mulched by the orks, which were now poised to eat up my Riptide and Commander as well. Both of my crisis suits arrived, but the Night Scythe did not. Perhaps for the best, since the Quadgun was still manned. He attempted to intercept one of my Heatwaves, but I passed my armour save. So far the plan was technically working: I'd successfully drawn an ork mob to my side of the table, though it was a bit quicker than I'd planned. 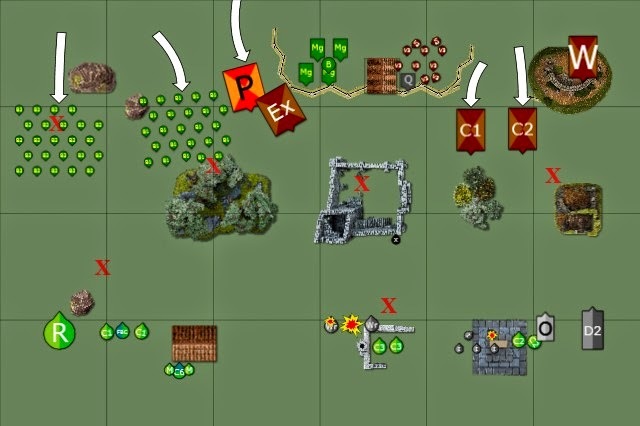 I needed to keep the other ork mob interested in that side of the board, so I dropped my monats around the mob that had just finished creaming my poor Deathrain-D's. They both scattered, but did not mishap. 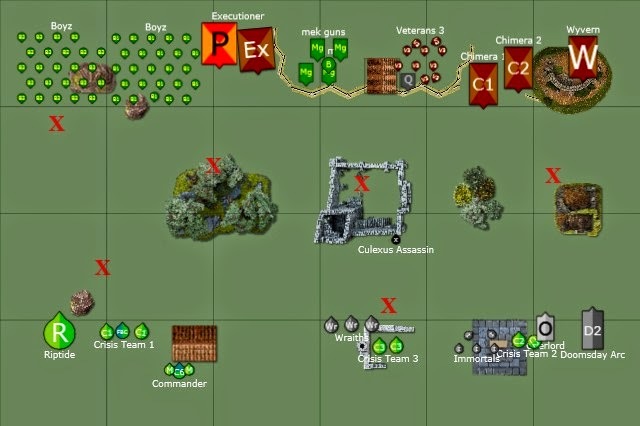 I moved my units further to the right, getting ready to make a break for it. The Wraiths and Assassin both prepared to assault the vets manning the Quadgun, intending to make it safe for the Night Scythe to arrived. I'd forgotten the psychic phase, but they let me use my assassin's Animus during the shooting phase. I killed a couple more meltavets, which reduced them to only a couple members. They failed their morale check and fell back towards the Aegis. The Doomsday Ark fired at the Executioner but did nothing. My crisis suits fired at the Wyvern and got one shot through to strip a hull point. "If I ever get to swing my Scythe, you will be sorry!" My teammate, thinking his Overlord would easily kill the weak plasmavets, charged them and killed one with Hammer of Wrath. Their higher initiative and Krak grenades killed the Overlord before he could even attack. Thankfully, he passed his resurrection roll and piled back into combat (Note: we handled this combat incorrectly. Chariots, characters, challenges, consolidations, and resurrection protocols all made it a nightmare to figure out so we winged it) . 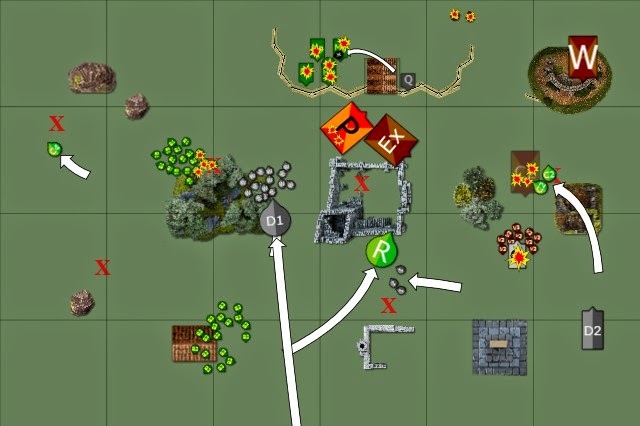 My Assassin took a wound during Overwatch, killed a few Vets, won the combat, and swept the unit, consolidating into the nearby ruins. My suits made their thrust moves and I positioned my commander to screen the incoming horde from my Riptide. My newly arrived Heatwaves were able to reach an objective and contest another. The meltavets continued running towards the edge of the board, The orks prepared to assault the contesting Heatwave and my Commander. The Weirdboy hadn't done much up until now, casting powers that either didn't kill anything or failed to manifest. At this point, he periled and rolled a 6. Mercifully, he failed the leadership check and lost a wound instead of becoming a mini-monstrous-creature. The Wyvern tried to kill the Wraith, but my partner passed his invulnerable saves. One of my crisis teams was wiped out by the Executioner and split fire from Pask killed the last Wraith. 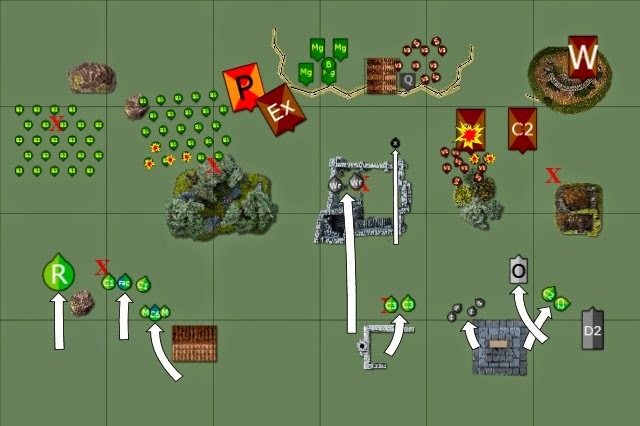 Ork shooting was much worse, the mek guns failed to kill my Heatwave in the open (they didn't have any good targets to shoot), and both ork mobs failed to kill their assault targets with shooting. 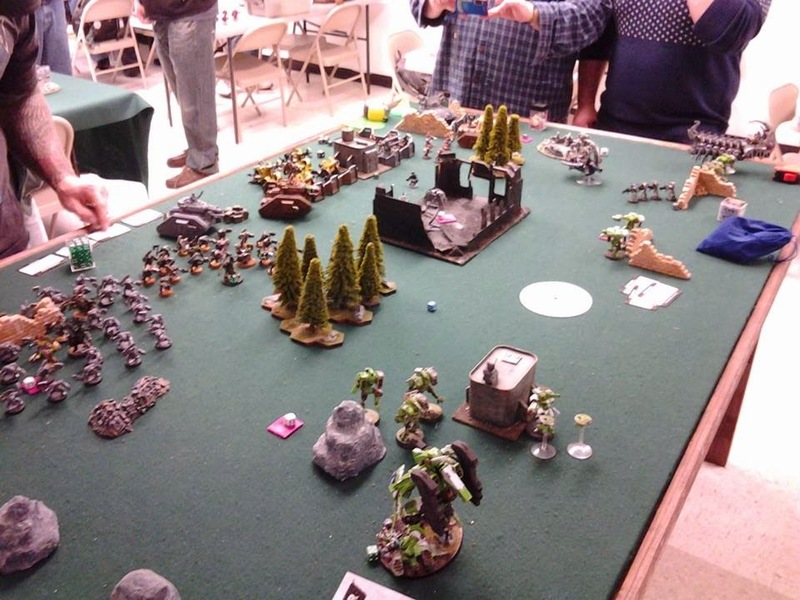 The orks charged my units, losing a few orks to Overwatch (dual Flamers baby!). My commander bravely challenged the horde, cutting the accepting mek (I was hoping for the Weirdboy) to pieces before the rest of the orks finished him and his drones off. Obviously the lone Heatwave died instantly and the Necron overlord went down to Krak grenades again. But...he resurrected again! My teammate was pretty bummed about his awesome chariot getting bogged down by some veterans, but at least he'd "survived" 2 rounds of combat when he didn't even get to hit back. Mercifully, the Night Scythe arrived from reserves. Looking at our objectives, we needed to hold 3 different objectives for 4 points. 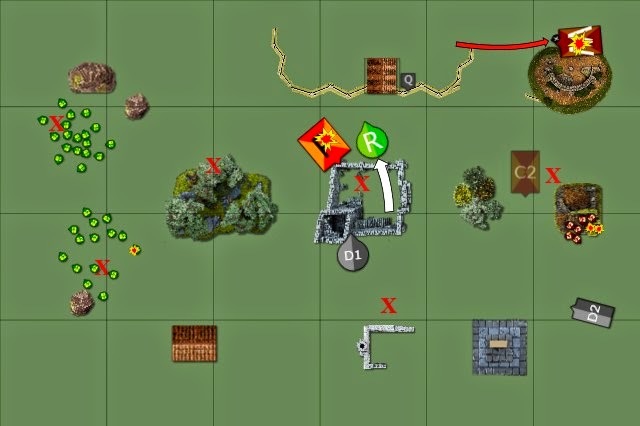 2 points were currently held by an ork mob and a Chimera; the other was in range of my lone Heatwave now that the Orks had run off it to kill my commander. I Nova Charged my Riptide's jetpack to try and make my escape. 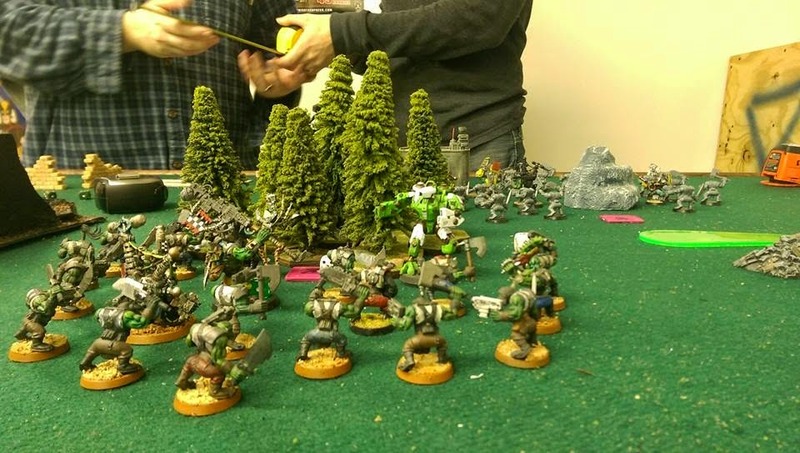 Up until this point I was letting my partner make most of his own choices, but this time I instructed him to bring the Night Scythe on and disembark his warriors within 3" of the objective held by an ork mob. I moved my Riptide away, moved my crisis suits toward the Chimera, and got my Assassin into position to kill the mek guns. My Assassin used his psychic phase to finish off the fleeing meltavets, just to be sure they didn't rally. I ran my Riptide and moved the Heatwave onto an objective. Then I had my crisis suits shoot the Chimera (glanced it once). The Night Scythe killed just enough Orks that the mob was no longer holding the center objective. 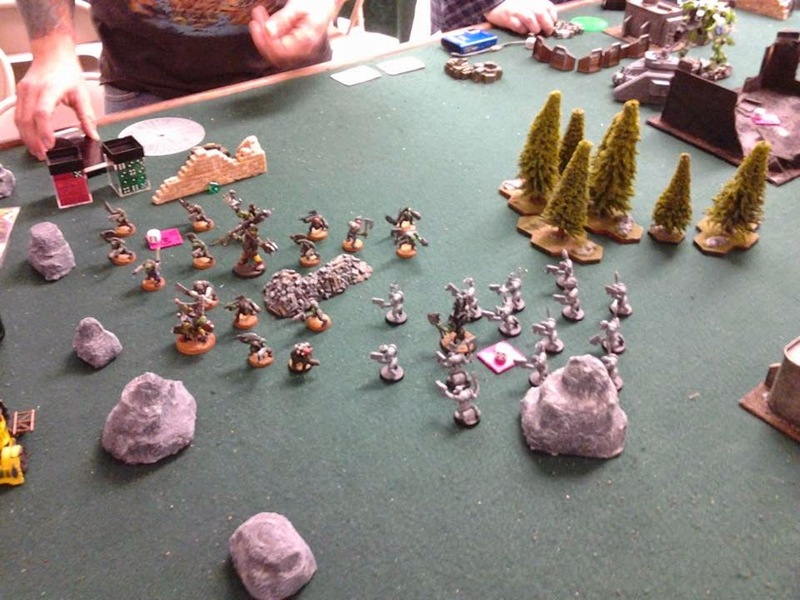 My partner really wanted to shoot up the Ork mob with his warriors, confident that he could kill it. I eventually convinced him that we needed to try and kill their warlord, so he fired at the nearby PunisherPask. Despite lots of shots and above average hits, he only got two glances. It's a good thing that I had decent luck with my rolls this game, because my partner's seemed to have abandoned him. The Riptide then activated its Nova Charged thrusters and jetted out of reach. My remaining Heatwave skipped on down to the objective recently vacated by the blood thirsty Ork mob. My crisis team charged the Chimera and kicked it into scrap, clearing the last objective that we needed. The plasmavets planted their Krak grenades on the Overlord again. They must have done it right this time because my partner finally failed his 4+ resurrection roll. 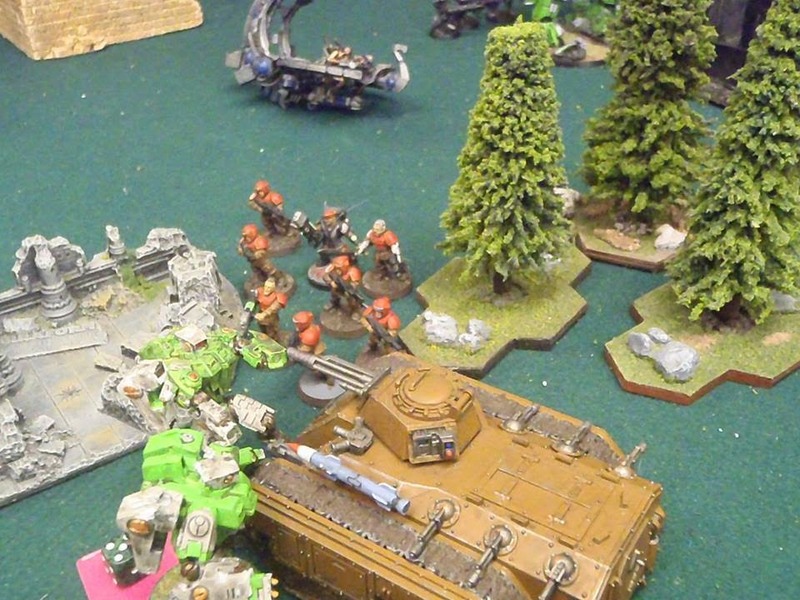 My assassin charged the mek guns and challenged the Big Mek to single combat. He promptly ripped him and a couple gretchin to pieces and then chased the remaining gretchin from the board. We scored all 4 of our Maelstrom cards that turn, but I believe that this turn they also scored 3 VP's with a good D3 roll. The plasmavets moved toward my crisis suits sitting on the right-hand objective. The lower ork mobs moved left towards my Heatwave since they now needed that objective, while the other ork mob prepared to erase the necron warriors. The Leman Russes moved to deal with the Necron warriors as well. 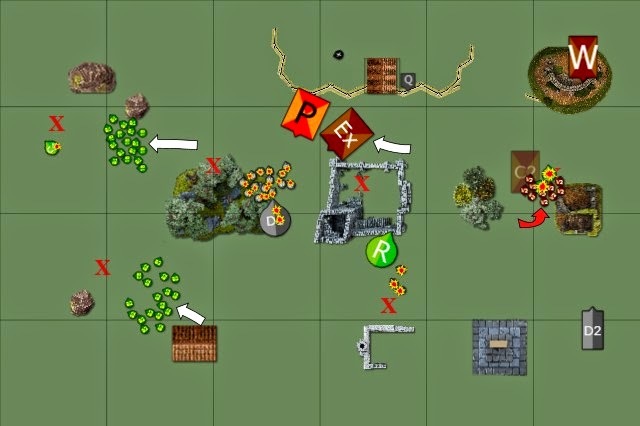 Both ork mobs ran toward their destinations, but both only ran 1". I guess they were tired from all the Waaaghing earlier. The Wyvern had little else to fire at, so it shot at the Immortals hiding behind my newly arrived Riptide, killing them all. PunisherPask then split fire with the Executioner. The Executioner fired at the Necron warriors, killing them all (close packed necrons make for good blast targets). Pask fired at the Night Scythe, which Jinked and escaped with a single hull point. The orks couldn't charge because they'd already used their Waaagh and ran. The vets, however, had no trouble getting into combat and killing my Deathrains without losing a single veteran. At this point we only had a handful of models left on the board, but we were still winning on VP's. All we had to do was survive till the end of the game and keep scoring points. Those tanks were still giving us a pretty hard beating, so being tabled was still a very real possibility. Our objective cards at this point were pretty difficult (some were impossible) to achieve. With only a few models, our chances of scoring one were slim. So we focused on killing whatever we could reach. The Riptide nova-charged its shield for the 3+ invulnerable and then moved toward the Russes. Since it had jinked and had no good targets, the Night Scythe zoomed off the board. Hopefully when it came back it could help out in the final turns. The Heatwave positioned himself to torch some orks, and the Assassin moved toward the Wyvern. My Assassin fired in the psychic phase at the Wyvern's side armour, but did no damage. The Heatwave got a decent number of hits, and due to positioning was able to kill a few orks and wound the Painboy (the kustom force field was over 6" away from most of the orks hit). The Doomsday Ark fired at the Leman Russes, but did no damage. The ark's gauss weapons shot at the nearby vets, killing a couple. My assassin ran straight for the Wyvern, hoping to kill it next turn. The Riptide, with some fortunate rolling, exploded the Executioner with its Fusion Blaster. Huzzah! My Heatwave jumped back behind a rock. It was a futile gesture, but it was better than sitting there waiting to get killed. The Riptide attempted a charge Pask, but since he'd killed the Executioner he had to roll very well to reach him, and failed. Unfortunately, the Executioner wasn't its own squadron, so we scored no VP's this turn. The orks had nothing better to do at this point, so they all moved toward my heatwave. The Wyvern turned to face the incoming assassin, and Pask prepared to shoot the Riptide. The plasmavets moved towards the Doomsday Ark. Pask unloaded on the Riptide and managed to wound it twice. 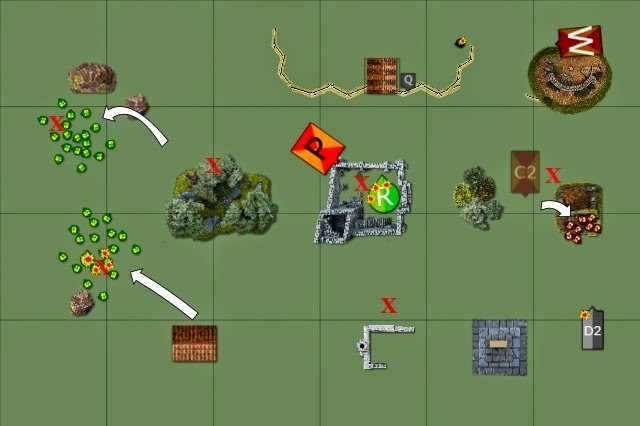 Every Ork in range shot at the heatwave, but failed to kill him. The Wyvern targeted the assassin and wounded him once. The plasmavets shot at the Ark, and glanced it once. The Orks charged the heatwave, losing the Painboy and another Boy to overwatch flamers. The monat then died in close combat, content with his contribution to the Greater Good. He had done an admirable job torching orks and claiming objectives. 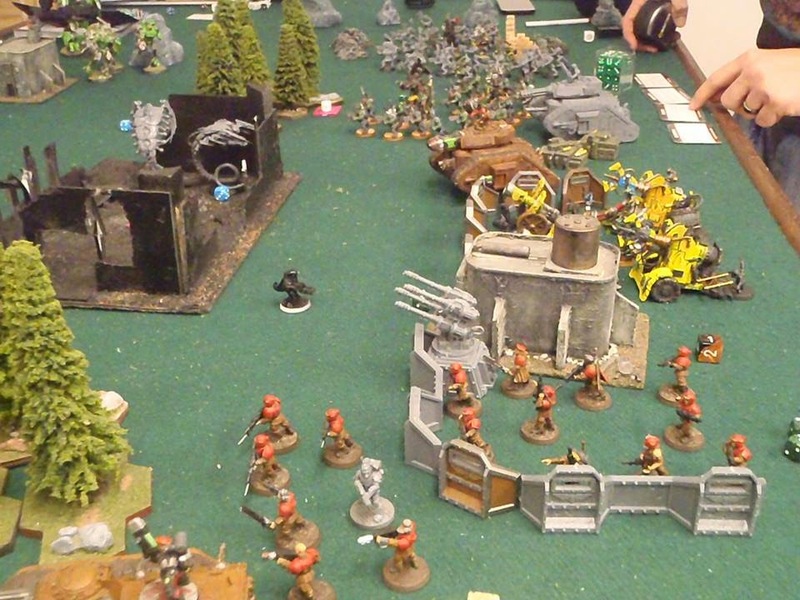 The Night Scythe flew back onto the board, lining up an attack run on PunisherPask. The assassin continued his advance and the Riptide moved next to Pask for a shot at his side armour. The assassin's animus couldn't hurt the AV12 of the Wyvern, so we went straight to shooting. The Night Scythe attempted to strip Pask's last hull point but couldn't quite do it. My Riptide stripped the last hull point with his Ion Accelerator and got us Slay the Warlord. 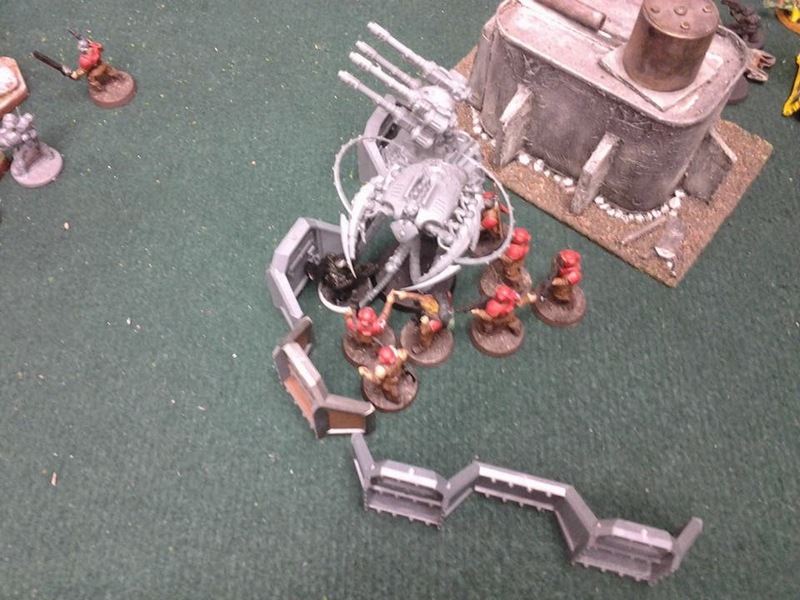 The Doomsday Ark fired its Gauss at the vets, killing a couple of the plasmagunners that were out of cover, and shot the main cannon at the mob of Boyz across the field, killing one. 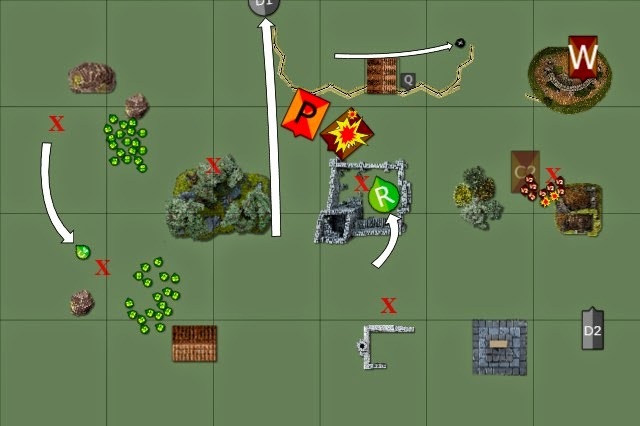 My Assassin made his charge, hit the Wyvern 3 times, and rolled 2 sixes for armour penetration. Very lucky rolling, if I do say so myself! The mental image of the assassin ripping the tank to pieces with his bare hands was pretty awesome. It isn't shown in the diagram, but my Riptide hopped into the enemy's vacated aegis line to ensure Linebreaker. Unts Unts Unts Unts Waaaaagh! Our last few turns were pretty devastating, nearly wiping the AM from the board. 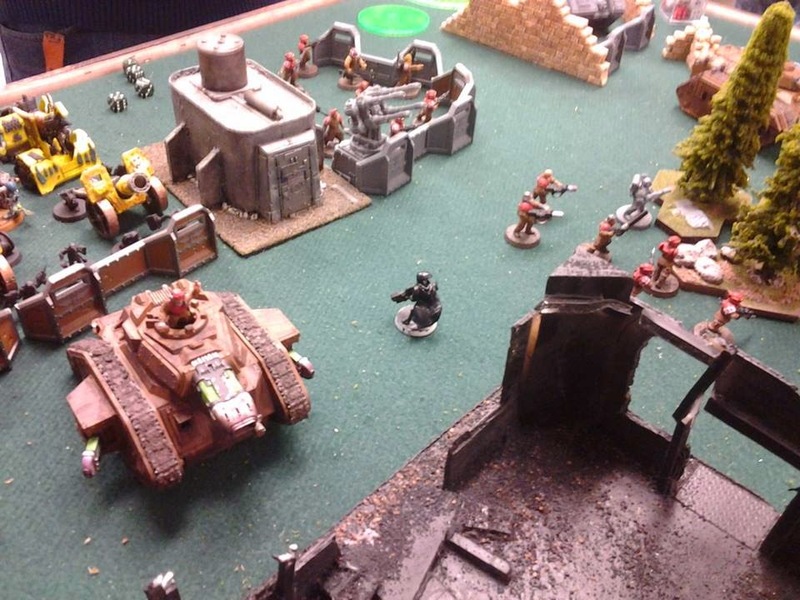 There was about half of a veteran squad, with a single plasma gun, hanging around the right side of the board. On the other side there were probably about 2/3 of the Ork mobs left, and only two of their characters had been killed. They were having a Waaaagh! party. The game was pretty close the whole time, and it was a blast to play. Our plan had worked out and the Maelstrom objectives had not abandoned us. My team-mate learned a lot about his list and wants to make some changes. Our opponents also learned that mobility can be a huge advantage in a Maelstrom game, so they may be changing their lists as well. My slippery suits (especially the Monats), bouncing around causing mayhem, were definitely contributors to our victory. First Blood, as always, was a deciding factor, since only one team can score it. Our objectives were tough sometimes, but we stayed focused on the mission and it paid off. Heatwave Monats. They are dirt cheap and did their job of objective-capping wonderfully. Their cheap, expendable nature made them straightforward to play and ideal for taking up a disproportionate amount of my opponent's resources. Culexus Assassin. An impressive kill record. Though he didn't score any objectives other than Linebreaker, I felt that silencing the Quadgun and the mek guns really helped us out late-game. Unfortunately, the cat is out of the bag, so now everyone knows just how deadly this guy can be. Deathrain-D. I think they were victims of circumstance this game. They drew the short straw when it came to deciding who to sacrifice for the first objective. In hindsight, I probably should have sacrificed my commander first. Anti-horde. A 5+ invulnerable and 5+ FNP on 30 Boyz is pretty insane. 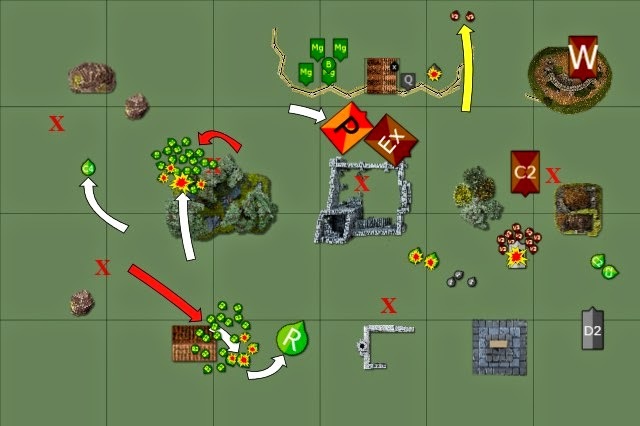 Had he put a horde at each flank or deployed second, I think we would have been toast because my units just can't put out enough shooty for that. Flamers didn't kill quite as many as I'd hoped either. Low model count. If I had a few more unlucky rolls, the game could easily have gone way downhill. It can be scary playing with so few models, knowing that so much depends on so few. Surprises. Some of our success was due to tactical errors on the part of our opponents. Normally, you can't rely on your opponents to make those mistakes. If we had a rematch, things would be much tougher on us. Thanks for reading! It was a long one, so I hope you enjoyed it.